Tracking (Training) is defined as the procedure required to make the conveyor belt run "True" under all operating conditions. A conveyor belt must run "True" to avoid material spillage at the transfer points and a conveyor belt must run "True" to avoid damage to the edge of the conveyor belt. The basic and primary rule of tracking a conveyor belt is simply “The belt moves towards that end of the roller it contact first.” The conveyor belt will travel where directed if it has been manufactured, slit and spliced correctly. The conveyor structure must be “True” (relative to the centre line) and level (side to side). a. To prevent slippage between the drive pulley and the belt. b. To force the belt to conform to the crown on the crowned pulleys. Cleanliness is essential to good belt tracking. Foreign matter creates a new and changing surface to rollers and pulley faces – adversely affecting tracking. Conveyor belt must be straight and ends must be squared and spliced properly. The normal sequence of training is to start with the return stand working toward the tail pulley. Following with the top side in the direction of belt travel. Start with the belt empty. After tracking is completed, run the belt with a full load and re-check tracking. Tracking adjustment should be spread over some length of the belt preceding the region of trouble. Permit the belt to run for at least three full revolutions after each idler has been adjusted to determine if additional adjustment is required. If the belt has overcorrected it should be restored by moving back the same idler and not by shifting additional idlers or rollers. Sunken or not level foundations. The driving and idler pulleys not normal to the conveyor centreline and not parallel with each other. Seized or out of round rollers. Transverse forces applied to the belt by items such as over tight or angled belt scrapers. Material build up on the pulleys, belt or rollers. Damaged, twisted and/or missing conveyor idler frames. Uneven placement of load on the belt or the belt being loaded off centre. Worn pulley faces, pulley lagging unevenly worn or pulley shaft locking elements worn. Trough and return idlers not installed at right angles to the axial centreline and therefore the belt not making proper contact with the rollers. Trough idlers installed back to front with the lead roller not leading. 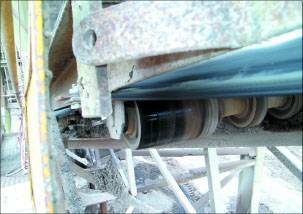 Offset trough idlers being used on reversing conveyors rather than in-line idlers being used. Out of round or seized rollers giving the belt contact forces asymmetric to the centreline. Poor belt quality with the weave / fabric asymmetric to the centreline. Belting of a different manufacture in the same length. Mechanical fasteners not installed square. Conveyor rollers of various diameters installed. Poor workmanship with belt splicing / slitting / ends squaring. This includes localised edge repairs with associated tension differences. Transition idlers not installed or unevenly adjusted. Excessive tensioning of the belt preventing all of the idlers from helping to direct the belt. Under tensioning of the belt which restricts the pulleys from controlling the belt. This also applies to all pulleys including take-ups. Uneven or misaligned pulley take-up carriage forces. The belt hotter on one side than the other, for example near a furnace. Traveling trippers and shuttle not running true. One side of the belt running wet. Extraneous articles fouling the conveyor belt. The belt too stiff for the idler width or trough angle, therefore not allowing the idlers to direct the belt. Return idler spacing too great to direct the belt. Existing self-aligning idlers worn out, seized, or locked into position. Existing self-aligning idlers installed incorrectly or in wrong location. Incorrect belt storage which has caused the belt to warp or bow. This article was supplied by Kinder & Co., an independently owned single source marketer and manufacturer of specialised conveyor products servicing companies reliant on conveying and processing of bulk solids.